A small group of adults with disabilities in Chesham enjoy a weekly painting class run by two volunteers. DEMAND was contacted and asked to make an easel more suited to the painters’ needs. After watching them in action, we designed and made an easel with a wide range of adjustment. This allows the volunteers to position the canvas much closer to the painter, which is a help if they have a limited range of movement. Previously, the canvas would have to be held by the volunteers to achieve close and angled positions, but with the new easel, the painters will enjoy uninterrupted art sessions. Living with disability can often restrict the way people are able to express themselves. An art therapy class at a residential home gave a voice to adults with Cerebral Palsy, but the helpers struggled to hold the canvasses in the best positions, or for the length of time required, for the wheelchair-using artists. The solution was to develop an easel that could be almost infinitely adjustable and hold large and heavy canvasses securely in a way that suited each painter, as shown by Tina, left. When the product’s success led to the group requesting another easel, an opportunity to help even more people arose. 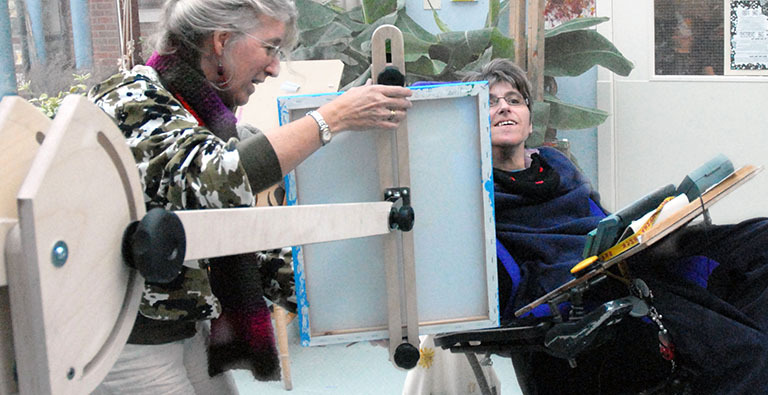 Now, after refining the design to make it lighter, stronger, and easier to use, several easels have been produced to give more people with restricted mobility the opportunity to explore their creativity.